Alejandro Hurtado will need to learn fast if he is to make a success of his new career in motorsport management. The successful Chilean is renowned worldwide for his exploits in football management. His achievements have allowed him to retire from the game early to pursue other projects and interests. The world of motorsport is an ever changing environment and one that Hurtado will need to adapt to quickly if he has any chance of making this new life chapter a happy one. 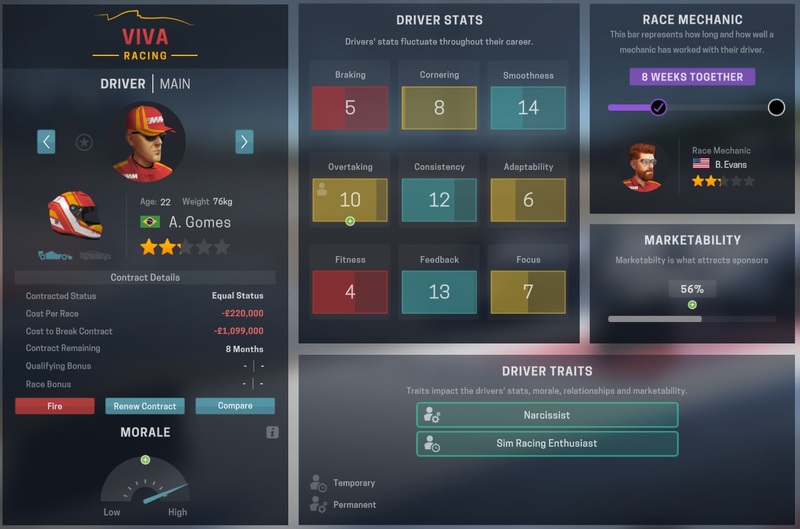 We will be following Hurtado throughout his career as manager of the newly created motorsport team VivaRacing. VivaRacing will be satisfied with their debut race in the European Racing Series. Anthony finished in 16th position with Gomes two behind in 18th, giving the team a 9th place finish in the team standings. 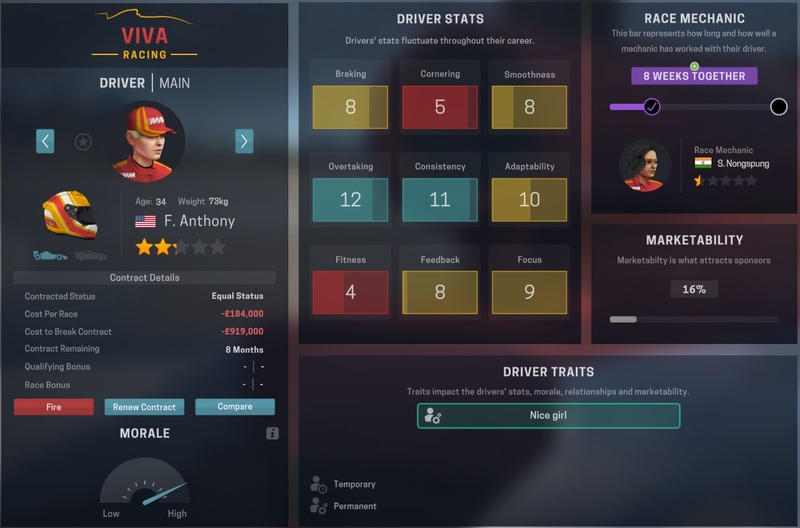 VivaRacing have decent drivers in comparison with other teams, ranking in 7th place in terms of driver quality. 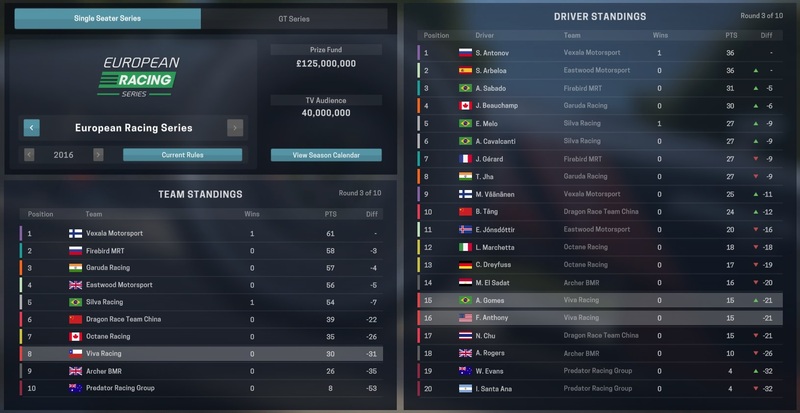 However, in each other field the team rank in 10th place, having the lowest ranked car, staff, headquarters and sponsors of all 10 teams in the series. An impressive performance from the Gomes and Anthony saw them finish in 9th and 11th place respectively. A well-managed race shows some good signs for the team moving forward. 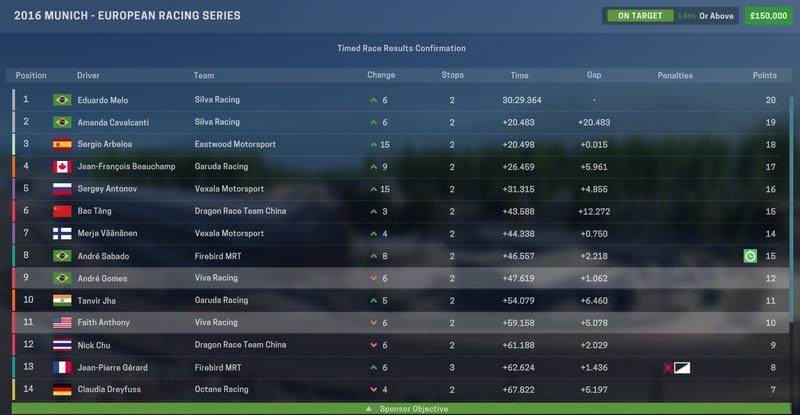 The expectation of the board is that VivaRacing finish 10th or above (which is an odd expectation to have considering it’s impossible to finish any lower). Hurtado himself is far more ambitious than that and will be eager to push on from this stable start. Thanks for reading a brand new series on VivaLaVidaFM. In bringing out a series on a new game it may take some time to find out what works when writing posts, so please do leave any feedback you have in the comments section below. 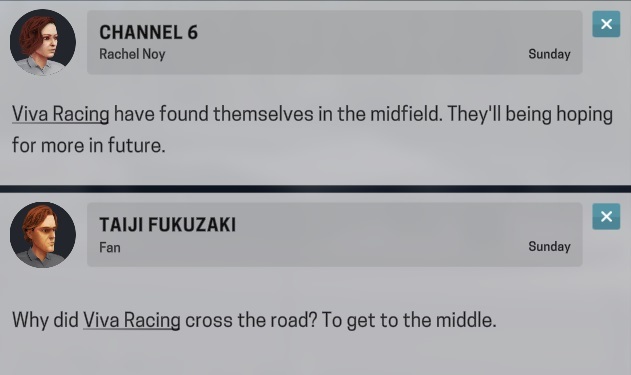 This website predominantly publishes posts on Football Manager, however I’m keen to introduce new content from other games too. If you are interested in following this series then do follow the blog! Just add your email to the box as displayed either in the sidebar (pc or laptop) or below this post (mobile). 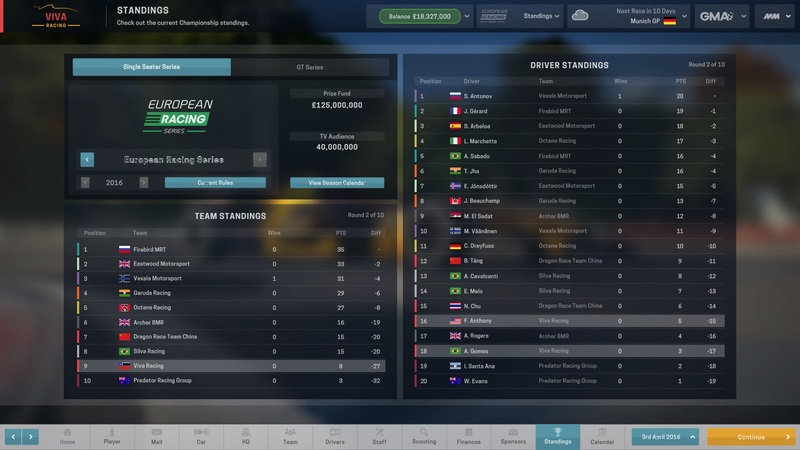 This entry was posted in Motorsport Manager and tagged alejandro hurtado, black sea gp, motor racing, Motorsport Manager, munich gp, vivaracing. Bookmark the permalink.